Fort Worth offers premier membership clubs that make you feel right at home. One of Fort Worth&apos;s best known businessmen, Marvin Leonard founded two of the cities private clubs: Colonial County Club and Shady Oaks. Revel in the history of Colonial Country Club as you walk the same greens as Ben Hogan and Sam Snead did years before. This par 70 course has hosted the annual Fort Worth Invitational since 1946, which holds the record for longest running non-major PGA Tour held at the same site. If you&apos;re lucky enough to play this exceptional course, make sure to pick the right club when hitting on the "Horrible Horseshoe." The 5th hole of the course stands as one of the best and most difficult holes in America. Shady Oaks, a private and member-owned club, fulfilled Mr. Leonard&apos;s dream of making one of the finest courses in the world. His love for golf was bigger than Texas itself and building courses was his speciality. Members enjoy an 18-hole course, driving range, putting green, the "little nine" golf course, and full-service golf shop. As golf icon Ben Hogan once said, "you won&apos;t find anything like it..any place else in the world." Public courses in Fort Worth set the bar high. The Golf Club at Champion Circle not only provides a challenging and scenic course, but amenities and proximity to nearby entertainment such as Texas Motor Speedway. Located just two miles north, visitors can enjoy NASCAR and Indycar three times a year in addition to their rounds. The course is a perfect spot for your vacation or business travels with the Dallas/Fort Worth Marriot Hotel serving as a backdrop and DFW Internatinal Airport just 20 miles away. Consider a "Play and Stay" package deal from the hotel, which offers a luxurious stay with flexible meeting space and exquisite catering after a day of golf. Don&apos;t pass up the opportunity to play the "River" course at Pecan Valley, considered one of the top municipal courses in Texas. Separated by the Clear Fork of the Trinity River, the "Hills" is Pecan Valley&apos;s second 18-hole course and is 150 yards shorter than the "River." A friendly staff and self-service snack bar makes your round of golf on this well-kept course even more pleasant. Another public course for golfers on a budget is Meadowbrook Golf Course. The par 71 course is an 18-hole regulation facility and considered one of the top in Texas. Be ready for some fun ups and downs at Meadowbrook, though; it has the most rolling terrain out of the city&apos;s five courses. No matter what your skill level, Waterchase Golf Club can accommodate . With six sets of tees, this Par 72 course boasts a cascading waterfall as well as an exceptional variety of holes. The club received a nomination to Golf Digest&apos;s Best New Courses and promises to be "a round you&apos;ll remember." Adjacent to the Waterchase Golf Club is the Jim McLean Golf Center. As one of the top golf schools in the United States, this 9-hole, par 3 "academy" course is the perfect place to brush up on your skills before a round of golf. Take your time practicing on the 14,000-square-foot performance center that includes five indoor bays, a putting studio, a full swing simulator and champion bermuda green. Another impressive facility for lessons, and even new gear, is Leonard Golf Links located next to Nike&apos;s golf reaseach and development facility, The Oven. Take your game to the next level with a private lesson or enjoy a group instruction with your friends. Leonard&apos;s earned the name one of "America&apos;s 100 Best Clubfitters" due to their real grass range, launch monitors and focus on full flight of the ball. Leonard Links ensures the best equipment for instant improvement for golfers, so be sure to visit before playing a round on any of Fort Worth&apos;s splendid courses. Cori is the Public Relations & Marketing Intern for the Fort Worth CVB. 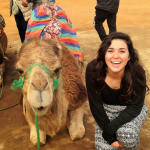 She is currently a senior at Texas Christian University, majoring in Marketing with an international emphasis.